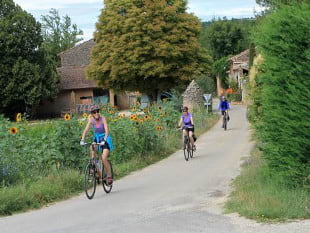 ﻿ Provence Bike Holidays| Hosted Cycle Trip| Availability 19. - GPS self guided bike tours for all! 2019 PROVENCE BICYCLE TOURS - LATEST B&B AND VILLA AVAILABILITIES. You'll find below our remaining availabilities for both our B&B and Villa Provence based bike tours. If the dates you require are not available at your preferred location, you might like to consider our other accommodation option. B&B BASED CYCLE TOURS - 6 nights. Arrival days vary. Spring Offer prices - from €994 to €1,074 per person. 6 nights. Arrivals on Saturdays, departures on Fridays. Spring Offer prices - from €756 to €1,098 per person. April 2019 From Tue 16th April - sold out. From Wed 24th April - sold out. From Sat 20th April - sold out. From Sat 27th April - sold out. May 2019 From Thurs 2nd May - 2 rooms available. From Fri 10th May - 1 room available. From Sun 19th May - sold out. From Tue 28th May - sold out. From Sat 4th May - available. From Sat 11th May - available. From Sat 18th May - sold out. From Sat 25th May - available. June 2019 From Thurs 6th June - sold out. From Fri 14th June - sold out. From Sun 23rd June - sold out. From Sat 1st June - available. From Sat 8th June - sold out. From Sat 15th June - sold out. From Sat 22th June - sold out. From Sat 29th June - available. July 2019 From Wed 3rd July - 1 room available. From Thurs 11th July - 4 rooms available. From Sat 20th July - 1 room available. From Mon 29th July - sold out. From Sat 6th July - sold out. From Sat 13th July - available. From Sat 20th July - available. From Sat 27th July - available. August 2019 From Tues 6th Aug - sold out. From Wed 14th Aug - sold out. From Fri 23rd Aug - 4 rooms available. From Sat 3rd Aug - sold out. From Sat 10th Aug - sold out. From Sat 17th Aug - sold out. From Sat 24th Aug - sold out. From Sat 31st Aug - available. September 2019 From Sun 1st Sept - 2 rooms available. From Mon 9th Sept - 1 room available. From Tues 17th Sept - sold out. From Thurs 26th Sept - 3 rooms available. From Sat 7th Sept - sold out. From Sat 14th Sept - sold out. From Sat 21st Sept - available. From Sat 28th Sept - available. October 2019 From Fri 4th Oct - 4 rooms available. From Sun 13th Oct - 4 rooms available. From Mon 21st Oct - sold out. From Tues 29th Oct - sold out. From Sat 5th Oct - sold out. From Sat 12th Oct - available. From Sat 19st Oct - sold out. From Sat 26th Oct - sold out. B&B BASED CYCLE TOURS - 6 nights. Arrival day varies. Spring Offer prices - from €994 to €1,074 per person. From Wed 24th April - sold out. From Tue 28th May - sold out. From Sun 23rd June - sold out. From Mon 29th July - sold out. From Fri 23rd Aug - 4 rooms available. From Thurs 26th Sept - 3 rooms available. From Tues 29th Oct - sold out. 6 nights. Arrivals on saturdays, departures on fridays. Spring Offer prices - from €756 to €1,098 per person. April 2019 From Sat 20th April - sold out. May 2019 From Sat 4th May - available. June 2019 From Sat 1st June - available. July 2019 From Sat 6th July - sold out. August 2019 From Sat 3rd Aug - sold out. September 2019 From Sat 7th Sept - sold out. October 2019 From Sat 5th Oct - sold out. Bookings are now open for 2020! 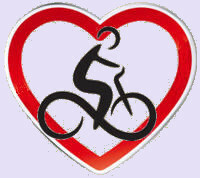 Please click here for our bike tour availabilities. and we will mail you back as soon as possible. "Following our fantastic experience at Neil and Nat's B&B, my wife and I were desperate to return to the Luberon, Provence for more cycling, and I can honestly say that the Villa exceeded our expectations." 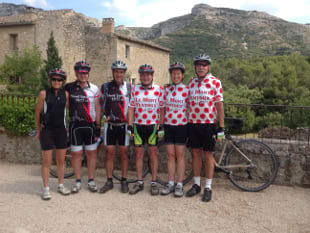 Sept 16 Villa based, Provence bike tour review. "We would without hesitation return as we feel there is still much to explore on our bikes and Neil and Nat are so welcoming. The Villa is fantastic for those wanting a little more independence and privacy in comparison to the B&B and perfect for a family or a group of friends. Really a first class service. Despite being away from the B&B we still felt we were just a well looked after as if we were staying there. The only thing we missed was Neil’s cooking. Hopefully when we return our daughter will be able to go in a bike trailer so she can join the fun too.